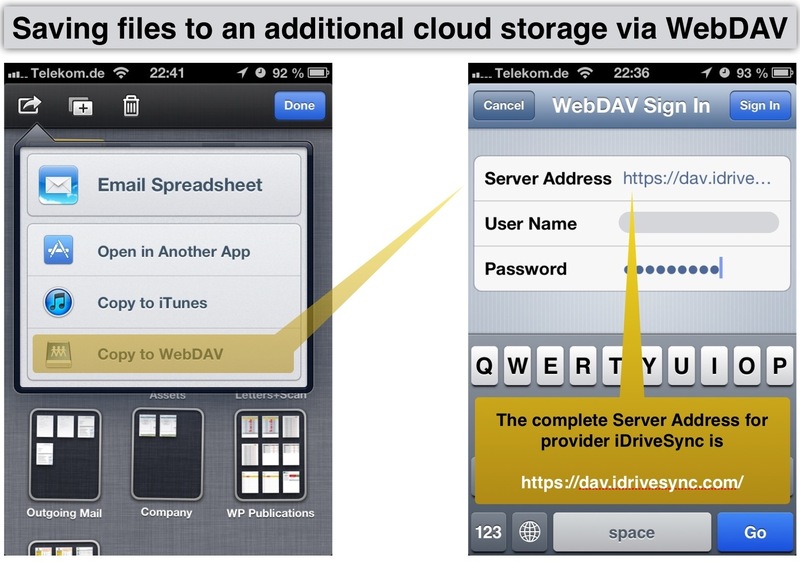 For my readers, who are not experienced with all these technical aspects of today’s digital world I want to describe WebDAV and how to use it when working with iWork-Applications. WebDAV (Web-based Distributed Authoring and Versioning) is a method that allows you to edit and manage files stored on remote servers. By linking to a WebDAV location from your iWork for iOS app, you can easily copy documents to and from a remote server or web service. If you access the internet e.g. put http://iNotes4You.com in the address field the communication between your computer and the webserver is based on http-Protocol. In simplified terms: You computer sends a message to the world wide web and normally gets an answer, the display of the requested website. HTTPS provides authentication of the web site and associated web server that one is communicating with. Additionally, it provides bidirectional encryption of communications between a client and server, which protects against eavesdropping and tampering with and/or forging the contents of the communication. In practice, this provides a reasonable guarantee that one is communicating with precisely the web site that one intended to communicate with (as opposed to an impostor), as well as ensuring that the contents of communications between the user and site cannot be read or forged by any third party. This protocol is an extension of the HTTP-Protocol. With a WebDAV-Connection (almost always via HTTPS) you can not only display informations but also manage files on webservers e.g. creating folders, copy files from your local storage to the webserver and delete files. Via your browser go to a provider where you can get storage capacity. If you want to use WebDAV-Protocol to save your iWork-Documents in the cloud ensure that your provider supports this protocol. At the time Dropbox does not, but e.g. iDriveSync. Later on you can configure access to the webserver in an iWork-Application like NUMBERS in order to be able to save and open documents. You easily can share documents with other people, have full access via an iOS-, Mac- or PC-Version via client applications or via internet without installing any software. You can use a WebDAV-Server for saving iWork-Documents. After you’ve signed in to a WebDAV server, you can copy documents to and from the server without signing in again. You’ll remain signed in to the server until you tap Sign Out in the upper-right corner of this same window. You can sign in to a different WebDAV server by signing out of the current server and linking to another one. This description sounds easy. But do you have addresses and complex passwords in mind? Configuration of more than one WebDAV-Access is strongly recommended. If necessary, navigate to the presentation you want to copy by tapping the folder in which it’s located. If no files or folders are listed, the server is empty. The availability refers to the free versions of cloud storages.